Wake up the mind and stimulate the senses. Running through a green herb garden peppered with fresh mint and citrus, under a turquoise sky, is just what the doctor ordered. Inhale and experience the rejuvenating scent of a crisp, cool waterfall as it washes over you — an invigorating sensation that clarifies the mind! An aroma melody of crisp and cool citrus and spruce. Top notes: lemon, citrusy, fruity. Middle notes: fir needle and crisp spruce. Base notes: sweet, spicy with woody undertones. Bright, festive top notes with floral, woody base. Top notes: bergamot tea, lime, and blue agave. Middle notes: lavender, jasmine, and woody patchouli. Base notes: bois de rose and woody. Fresh, cooling blend of fruity greens and florals. Top notes: fresh, clean and cooling. Middle notes: crisp and green infused with fruity florals and hint of wintergreen. Base notes: sweet floral undertones with warm, herbal nuances. Fresh and breezy florals against leafy green nuances. Middle notes: mixed fruit with crisp leafy green nuances. Base notes: soft, sweet, and musky with a hint of woody undertones. Tart, crisp blend of lemon, lime, and orange. Base notes: mild floral with peppery undertones. Floral blend with orange top notes. Top notes: tart citrus, citrus zest. Middle notes: rose and violet floral. Base notes: fresh musk, mossy. Bright tangy citrus in a fresh clean breeze. 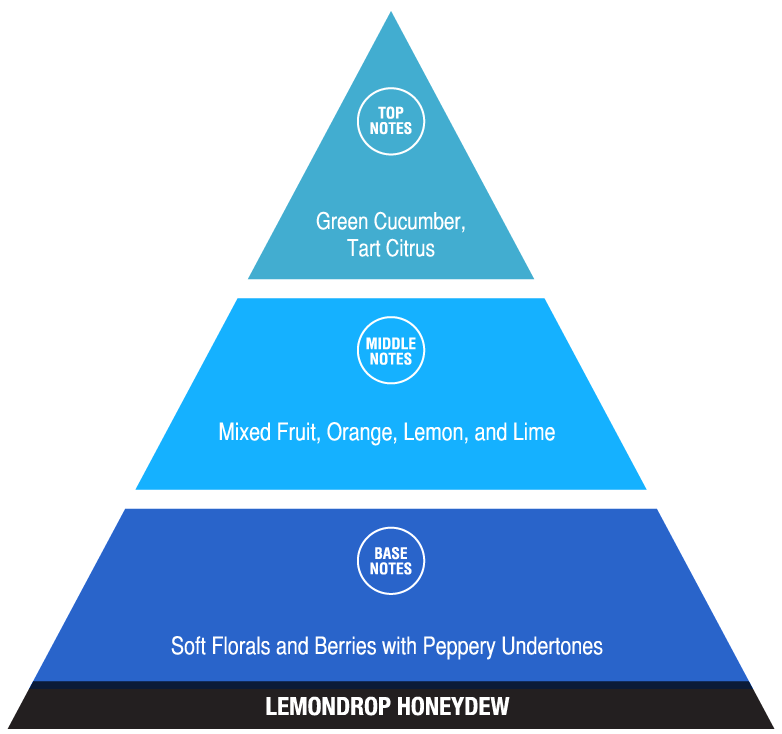 Top notes: fresh, clean, and lemony. Middle notes: crisp green with citrus. Base notes: smooth, musky floral with peppery undertones. Minty fresh citrus and mixed berries with soft florals. Top notes: cool mint, citrus zest, intense vanilla. Middle notes: fresh peppermint, tart citrus, with warm vanilla. Base notes: herbaceous with peppery and musky undertones. A light, breezy day mixed with crisp citrus and hint of warm florals. Middle notes: crisp and green with a tart citrus blend. Base notes: smooth floral undertones and peppery nuances. Crisp, leafy experience of evergreens, rich spruce set in the woody outdoors. Top notes: fresh and cooling with spice. Middle notes: green and leafy with rich spruce and balsam. Base notes: warm, sweet, and musky with woody undertones. 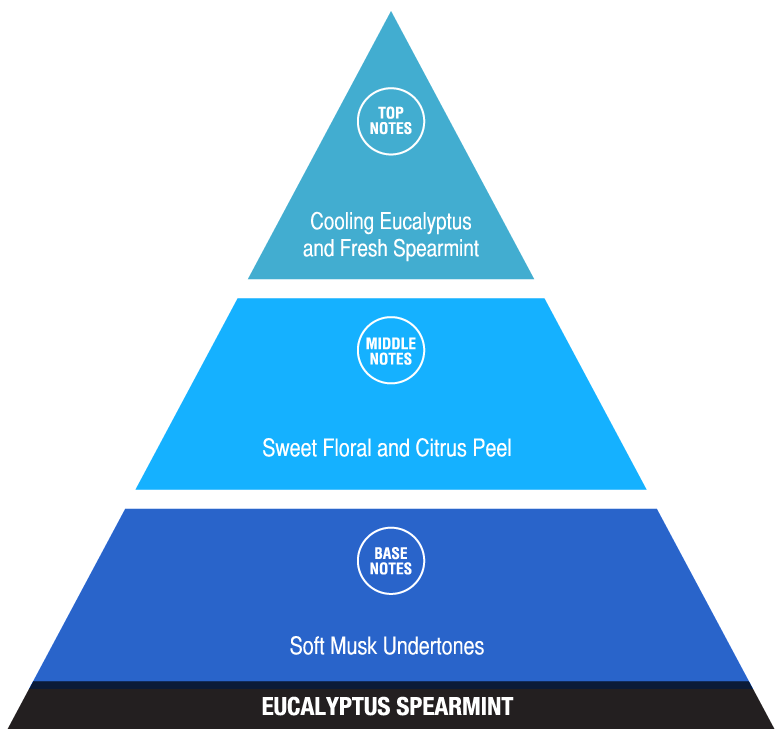 Revitalizing blend of crisp eucalyptus and fresh spearmint. Top notes: cooling eucalyptus and fresh mint. Middle notes: sweet floral and citrus peel. Base notes: soft musk undertones. Cool blend of fir and spruce with sweet base notes. Top notes: cooling and camphoraceous. Middle notes: fir needle and rich spruce. Base notes: warm, sweet woody undertones. Cooling forest of pine comes indoors among light florals and soft musk. Top notes: fresh and camphoraceous. Middle notes: fir needle and pine. Base notes: sweet floral with musky undertones. Fresh citrus and spice along a woodsy, piney path. Top notes: fresh, citrus, and spice. Middle notes: green florals with hint of cooling pine. Base notes: warm, woody, and herbaceous with patchouli undertones. Top notes: sweet orange zest, fresh lime twist. Middle notes: red navel orange, sweet floral. Base notes: bergamot, orange pith. Grapefruit citrus and green floral notes. Vibrant, clean blend of citrus and sweet earthy woods. Top notes: fresh citrus and spice. Middle notes: green florals, woody. Base notes: sweet sandalwood and patchouli undertones. Fresh, leafy, herbal blend with warm, musky undertones. Top notes: fresh, clean, and cooling. Middle notes: intense green with leafy nuances. Blend of sun-drenched citrus, fresh coastal breeze, and a floral bouquet of water lily and freesia. Top notes: fresh, zesty, lemon, grapefruit, tangerine, lime. Middle notes: mandarin, ginger blossom, apricot nectar, water lily, freesia. Base notes: sandalwood, mint, musk. A sassy blend of fresh cucumbers with a splash of tart citrus and soft florals. Top notes: green cucumber with tart citrus. Middle notes: mixed fruit, orange, lemon, and lime. Base notes: soft florals and berries with peppery undertones. 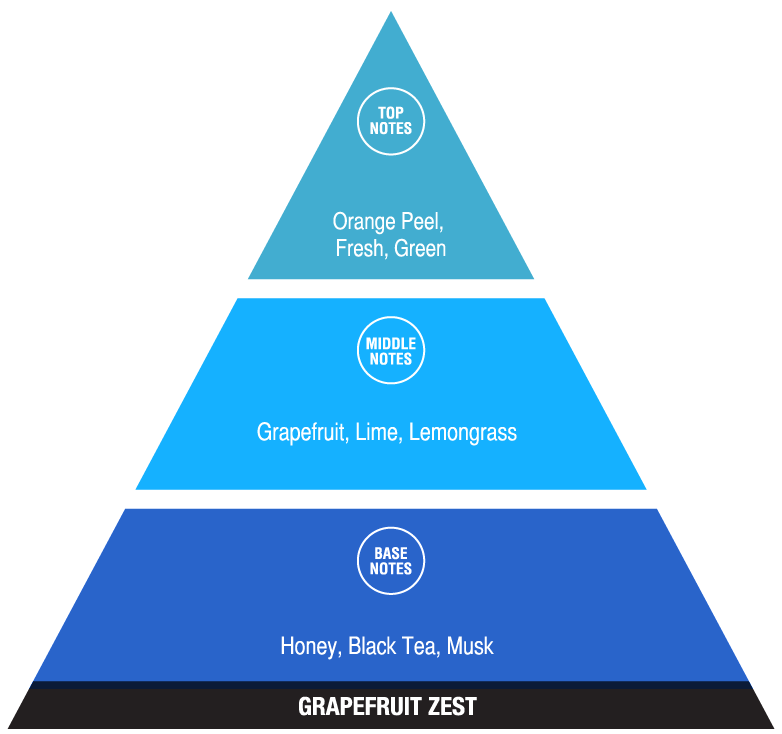 Crisp, energy-boosting blend of distinct citrus and green botanicals. Base notes: mild spice with floral undertones. Fresh, cool, sweet minty blend. 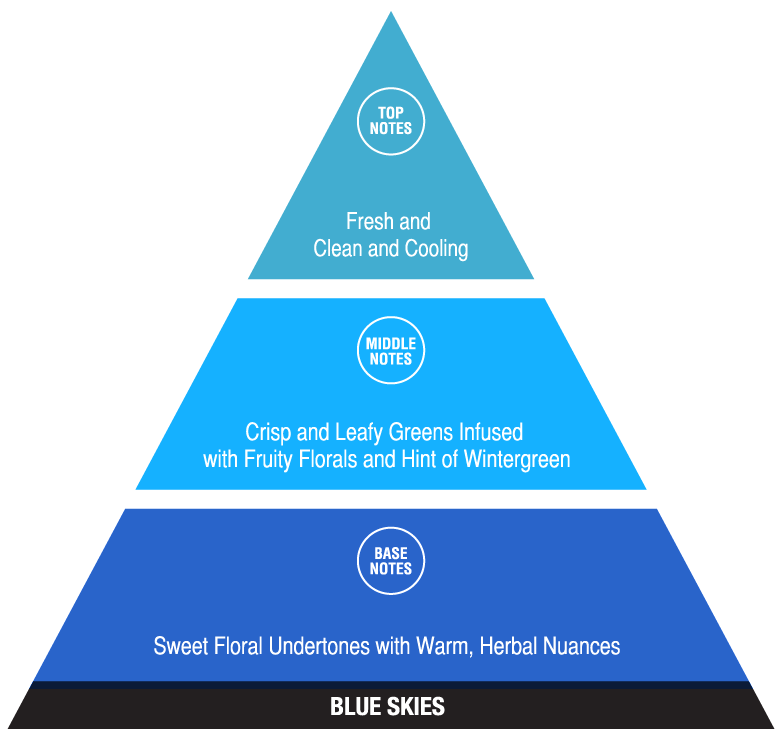 Middle notes: fresh peppermint, spearmint, and sweet wintergreen. Base notes: warm and herbaceous. The fresh outdoors with a blend of citrus and florals. Top notes: clean and ozonic, lemony. Middle notes: crisp citrus with floral nuances. Base notes: musky and smooth floral undertones. Tangy citrus meets smooth green tea with floral nuances. Top notes: fresh, lemon citrus. Middle notes: herbaceous, green tea. Base notes: florals, jasmine blossoms. A lush back yard sprinkled with mixed fruits and colorful florals. Top notes: fresh, clean, tangy. Middle notes: fruity mix and green florals. Base notes: woody with soft, sweet, musky undertones. Cooling peppermint with clean floral undertones. Top notes: fresh, cooling, peppermint. Base notes: lavender and rich geranium. Fresh fruit and vibrant florals kissed with hint of soft musk. Top notes: fresh clean and ozonic. Middle notes: green and citrus with mixed fruity floral nuances. Base notes: sweet and soft, musky undertones. Rich vanilla with the lightness of mint and lavender. Top notes: Clean and cooling with sweet vanilla. Middle notes soft floral nuances with wintergreen and citrus undertones. Base notes: warm, musky floral with herbaceous undertones.